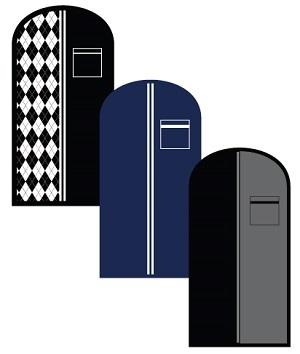 Tuxedo garment bags are not all dull and stodgy. Some bags have followed the fashion path cleared by tuxedo styles. These new tuxedo bags are dressed to make as big an impression as the prom date, father of the bride, best man, and even the groom! The new 48″ tuxedo bags and formal wear garment bags for men all feature quality materials and construction, with 7″ X 7″ ID pocket. Classic solid black – in stock now. Argyle pattern – in stock now. Solid navy – arriving late fall 2014. Two-tone black/gray – arriving late fall 2014. We’re raising the bar for in-house tuxedo bags, and they are going quick. Only orders placed by October 15th are assured timely delivery. Contact us now to get them in time to have your happy customers leaving with the most stylish tuxedo bags in town. 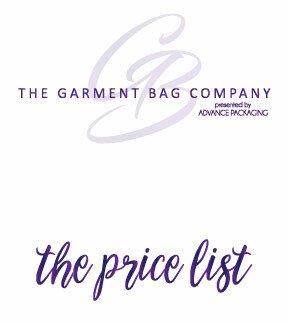 Custom garment bags with your logo, prints, colors, & more.